Social discovery and sharing platform Shareaholic today updated its browser share report, showing how the market has changed in the last eight months. While Chrome continues to dominate in desktop and mobile usage, the biggest change we noticed is that Firefox has dropped from second place to fourth, below both Safari and Internet Explorer. Between the two reports, Chrome’s usage has remained flat, losing just 0.03 percentage points. As a result, it is still used more than Firefox, IE, and Opera combined. Firefox meanwhile lost 4.66 percentage points, Safari slipped 0.96 percentage points, and IE fell 3.13 percentage points. 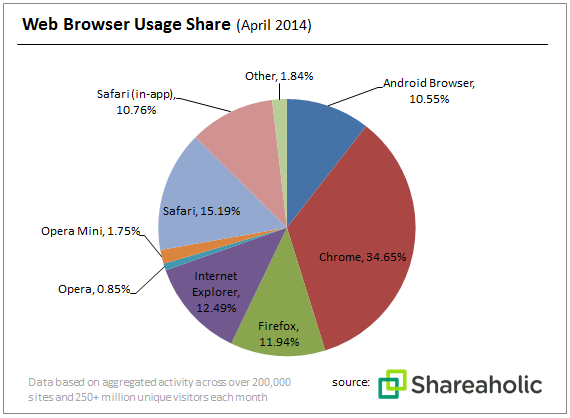 The Safari (in-app) browser and the stock Android browser were the only ones with meaningful growth. At this rate, the stock Android browser will soon challenge Firefox and Internet Explorer for a coveted “top 4” spot on the list for most used browser. More than half of the browsers tracked were in decline. Among the biggest losers were Internet Explorer and Firefox. Opera cannibalized its own market share. Though Opera’s mobile browser (Opera Mini) was among the three browsers whose usage shares grew during this study, that came at a cost to the market share once held by Opera’s desktop browser. The first point reminds us just how important mobile is in the browser market. It thus makes sense that Mozilla has developed Firefox OS: the company realizes it can’t compete with Google, Apple, and Microsoft if it doesn’t have its own operating system that comes with its browser. Those who keep up-to-date with our monthly browser share posts (latest one is here) will note an obvious discrepancy between the figures. For example, IE is still by far the most popular browser, according to Net Applications. First of all, Shareaholic tracked 250 million users visiting its network of 200,000 publishers while Net Applications captures data from 160 million unique visitors each month by monitoring some 40,000 websites for its clients. Next, Shareaholic is including mobile browsers in its data while Net Applications keeps desktop and mobile stats separate. Most importantly though, Shareaholic’s data encompasses the usage of browsers by measuring how many webpages are viewed by each browser. Net Applications meanwhile looks at users by measuring how many people using each browser are viewing webpages. It’s important to make the distinction between usage and users if you plan to look at “market share” figures.